2This Oracle Press certification exam guide prepares you for the new Oracle Database 12c certification track, including the core requirements for OCA and OCP certification. 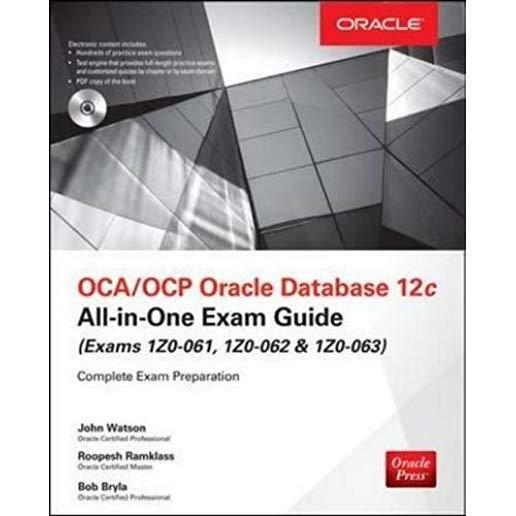 OCA/OCP Oracle Database 12c All-in-One Exam Guide (Exams 1Z0-061, 1Z0-062, & 1Z0-063) covers all of the exam objectives on the Installation and Administration, SQL Fundamentals, and Advanced Administration exams in detail. Each chapter includes examples, practice questions, Inside the Exam sections highlighting key exam topics, a chapter summary, and a two-minute drill to reinforce essential knowledge. 300+ practice exam questions match the format, topics, and difficulty of the real exam.